Attention Volcano The Bear fans! 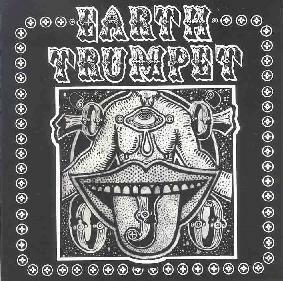 Earth Trumpet is a solo project from VTB member Laurence Coleman, and this is apparently the first part of a 2-CD series, the next to be released later this year. The music is firmly in the VTB realm with lots of wild experimental excursions, though this is more overtly spacey than the VTB recordings I've heard so far. There's a hell of a variety here. The disc blasts off in an avant-space rock realm with repetitive strumming acoustic guitar and piano, that culminates in a freakout including sci fi space synths and a heavy jam bit that recalls early grungy Guru Guru. Think jamming Krautrock meets avant garde experimentalism. There's also lots of good fun whimsical zaniness making for a collage-like manic run through one brief theme after another. I like the bit where what sounds like a Hammond alternates with crazed space-at-the-circus synth mania and then launches into a raw chamber music segment. Gongs, bells, and more of that gorgeous heavy pulsating Hammond sound continue to crop up as the classic sounds of the 70s meld with a free-wheeling improvisational feel that sees Coleman developing short themes that segue both seamlessly and abruptly from one endless section to the next. One moment we're grooving to a psychedelic freakout and the next we're trying to keep up with prepared string instrumental jams that explore noise-rock and general avant/freeform excursions. Some of my favorite parts are the organ/Hammond/synths (whatever they are) combined with percussion for some intense jams. In summary, there are lots of good ideas here and overall I really liked it but it's mostly a pastiche of ideas that would work well in larger contexts, being more of a collage work than anything else. But if you're well tuned to the VTB world and are intrigued by the description of the music then you'll likely find quite a bit to enjoy here.